Happy St Patrick’s Day! In honor of today, I wanted to showcase some of our Celtic style jewelry here at deBebians. We mostly offer wedding bands with Celtic knots, but we also have a few other items that incorporate Celtic knots. If you have something special in mind, do not hesitate to call on us. We can always custom design anything you have in mind. 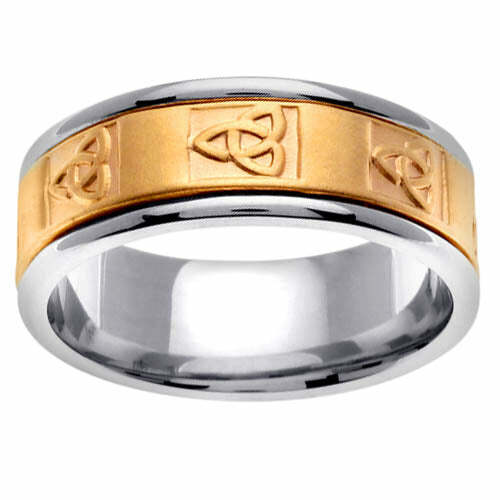 This two tone mens (or ladies) wedding ring features a Celtic knot design. At 8mm wide, this Celtic knot ring may be preferred by men more than women. This comfort fit Celtic knot wedding ring also comes in a wide range of finger sizes. 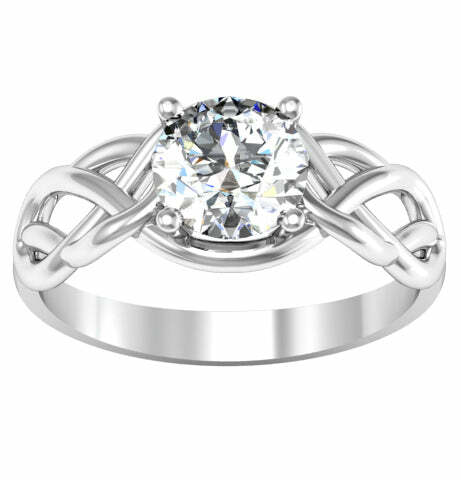 This Celtic knot engagement ring setting is quite popular. We manufacture our engagement rings in the finger size and metal that you request. We also make sure your center stone will fit perfectly into the setting by doing a 3D CAD with your center stone shape and measurements. If you are looking for a way to incorporate Celtic knots into your engagement ring setting, look no further. This 7mm wide Celtic knot design wedding ring is also one of our best sellers. At 7mm, this really can work for both men and women. 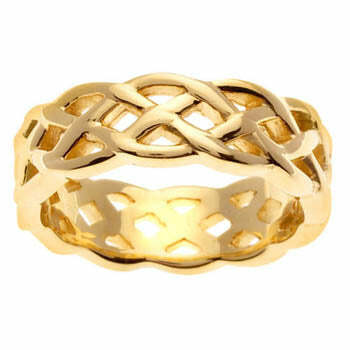 Be sure to consider this Celtic knot wedding ring in either 14kt white or 14kt yellow gold. If you are interested in a Celtic knot design wedding ring or engagement ring, be sure to check out these rings. You can also enter the word ‘Celtic’ into the search box at the top of the page and see more Celtic pieces of jewelry. If you have a design in mind, you can always reach out and speak with our jewelry designer. Happy St Patrick’s Day from all of us at deBebians!